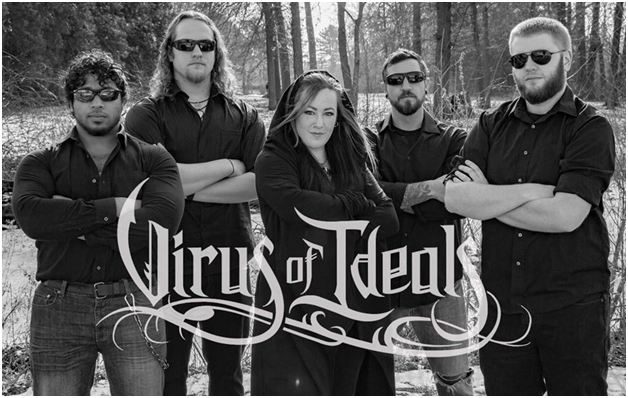 As their album fundraiser show approaches, Alternative Control had a virtual sit-down with Connecticut symphonic metal band Virus of Ideals. Here’s what they had to say about the band’s origins, the recording process, and more…. Don’t forget to check them out at Cherry Street Station (Wallingford, CT) on Saturday February 24th — and enter to win free admission with the widget at the end of this post! Tell our readers a little bit about the band’s history. Sean (Vocals/Keys): In the summer of 2014 I was playing around with the idea of starting a full band unrelated to ORCumentary (solo project I started in 2006). I hadn’t mentioned this to anyone though, and I wasn’t sure what style of metal it would be. Jess was a fan of ORCumentary and she messaged me out of the blue expressing interest in doing guest vocals on a future song. She sent me a demo of her singing Nemo by Nightwish and I was floored by her talent. I knew that whatever project I started, she needed to be a part of it. Jess (Vocals): Virus of Ideals was actually my first band. I always wanted to be in a band, but I was insanely anxious and nervous about working with other musicians. Because I knew Sean for a while through ORCumentary, I felt more comfortable sending him a demo. Sean: We jammed with a couple musicians later that year, but ultimately nothing came of it. We took a break afterwards and I compiled some ideas. We recruited Keith (Pearson) to play guitar and I wrote Bitter Parody in the latter half of 2015. In December of that year we recorded the single with Nick at Dexter’s Lab and released it in February 2016. Within a couple months of the single’s release we had a full lineup: adding Dylan (Heim) on bass and Francisco (Yepez) on drums. I wrote a few more songs in the spring and we spent a fair amount of time rehearsing and finalizing all our parts. Dylan (guitar): I also knew Sean through ORCumentary before joining Virus. We gigged together years ago with my old band Under A Serpent Sun. I originally joined as a bassist and eventually moved to guitar. When I first met with Sean concerning VoI, I had only been playing bass for about a week…lol. Sean: We booked studio time for the summer, but we had to part ways with Keith. This could’ve been a big setback if it wasn’t for Dylan; he stepped up and learned our songs on guitar, in addition to finalizing his bass parts, in just 3 weeks so didn’t have to reschedule studio time. We went back to Dexter’s Lab to record the 3 new songs and, like the single, we were blown away by the results. In August 2016 we played our first show to an absolutely PACKED crowd at Cherry Street, and we gigged all over New England for the next year or so. We got some great opportunities including opening for Leaves’ Eyes, Amorphis, and Dark Tranquillity. Matt (bass): I was asked by the band to fill in for them on bass for their first few shows. I must have done a good job because they asked me to stay on as their permanent bassist. It’s my first time playing bass for a band, and so there was a learning curve, as I’ve only played bass in the past for recording; but I enjoy the freedom that playing bass affords in terms of stage performance! Sean: We decided to take most of the fall and winter of 2017 off to recharge and rehearse new music. Francisco, unfortunately, decided to leave a couple months ago, which left us in a rough spot because we started planning for the spring and had confirmed gigs that we didn’t want to cancel. Fortunately we got in contact with Lee (Swanson) shortly after and we knew he’d be a great fit from the first jam session. After about a month of great jams, we asked if he wanted to stay on as our drummer and he said yes without hesitation. Lee (drums): I knew Dylan and Sean through various bands over the years in the music scene. I like the way Sean writes music and I felt like Virus of Ideals was something I could get into. I jammed with them a couple times and everything clicked. I got along with everyone well and I really like playing the songs. I’m glad they asked me to stay on. Sean, what made you go from a solo comedic metal act (ORCumentary) to starting a full band with super-serious music? Do you find it different performing without playing a character, or not really? Sean: I had been doing ORCumentary for 8 years when I decided to start (what would eventually become) Virus of Ideals. I just felt ready; I made a name for myself around the New England scene and I had a lot of practice writing unique songs. It wasn’t much of a stretch to apply my talents to a more serious form of metal. Many aspects of being a solo musician were beginning to wear me down as well, which is why I decided to take a break from it over a year ago. Performing with Virus isn’t as different from ORC as you might think. I developed a lot of confidence and honed my stage presence with ORCumentary and I applied a lot of that to Virus. I love interacting with the crowd and I’ve only gotten more confident. I have a dry sense of humor that I’m able to let shine here and there in our sets, but I can’t be as ridiculous as I was in ORC, of course. 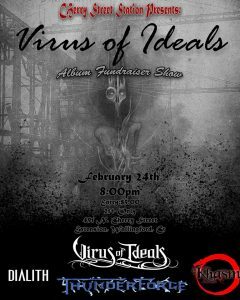 The Feb 24th show is a fundraiser for your upcoming full-length. What can you tell us about your plans for the album? How will this recording build on your 2016 EP For All My Earthly Days? Sean: The album will be a full-blown concept album, telling the entire story that was introduced with the EP. There’s still some writing and rehearsing left to do, but we have already thought ahead about what studio to go to and how we’re going to promote the album, among other things. We were surprised that the EP got a fair amount of attention from sites across the country and the world, so we’re confident the album will make an impact too. What do you think is the most difficult thing about recording? How about the most enjoyable? Jess: The most difficult part for me was the preparation. I remember feeling pretty stressed out, like we weren’t ready. The best part of recording is hearing the final product. Just knowing that all the hard work went to make something amazing. Dylan: Because we had to let our previous guitarist go three weeks before recording the EP, I had to quickly learn all the guitar parts in addition to finalizing all the bass parts for 3 songs. I basically recorded guitar and bass for 7 hours straight with no breaks. The best part was being done with all that! Matt: My least favorite part of recording is the “car test.” It may sound good on one set of speakers, but it can sound different on headphones, car speakers, etc., so you have to play the song on a variety of speakers to make sure it’s how you want the song to be represented. My favorite aspect of recording is adding accent pieces to a song that really bring it to life — the things that you can’t do in a practice. It really makes a song “breathe,” and the transformation from Garage Band to professional is always fascinating. Sean: Before Virus, I never recorded in an actual studio. We recorded the single and the EP, I felt a bit of pressure even though I knew our songs inside and out. The studio is a different animal compared to the stage and rehearsal space. I knew the keyboard parts inside and out, but because I was on the clock, per se, I felt I was almost second-guessing every note I played. With vocals it was the complete opposite; I love doing vocals in the studio. In our practice space and at gigs I often have a hard time hearing myself, but in the studio, I can hear myself perfectly. I can put every ounce of energy into every syllable, and just being able to fully hear the power in my voice is incredibly satisfying. I did vocals for 3 songs in an hour, which is quite fast. 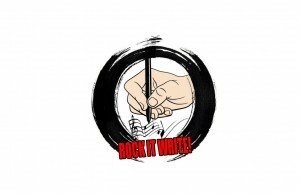 This is a stock question, but every band has a different answer — what is your songwriting process like? Sean: I’ve been writing all the music and lyrics so far. After I finish writing a song, I work with everyone individually and help them learn their parts. We also work through the parts together and the rest of the band brings their ideas to the table for putting their own imprint on the song. Ultimately the best idea wins. What is your inspiration for the dystopian ideas in your lyrics? Sean: ORCumentary’s lyrics were story-based, so it feels more natural to me to express ideas through story-based songs rather than standalone tracks. Dystopian sci fi films like Equilibrium and The Matrix are told from the perspective of someone in a dystopian society who’s trying to find a way to break free of a broken system. Our first album is an original story that puts a different spin on that by having most of the story being told from the perspective of the person who created the society (equivalent to maybe The Architect in The Matrix). The main character, simply known as “The Savior,” created a haven for those who survived a catastrophic nuclear war. As his own mortality creeps up on him, he turns to a risky experimental technology to stave off death to keep his noble mission going — but in doing so he unknowingly becomes the machine’s slave. It controls him and plunges his haven into dystopia. There’s a lot more to the story, of course, but for the sake of the interview this is the quick version. It seems like you put together a perfectly themed lineup of regional bands for your album fundraiser. How did you choose them? Jess: I got really excited when Khasm asked to be on our show. I actually auditioned for them back when I was 18. They were the first local-level band I ever got into. We’ve known Thunderforge for such a long time and they played our first show, so we’re glad to have them back. Sean: Dialith are relatively new to the scene and they are tight as hell. Being more of a European symphonic style, they fit the lineup perfectly. If you could go on tour with any national/international band, who would it be and why? Sean: Elvenking. They were one of the first metal bands I ever got into. Their songwriting has been a big inspiration to me before I even took my own songwriting seriously. I’ve also never seen them live (they only played one gig in the USA) so getting to see them play live a bunch of times would be awesome too. Jess: Epica. Their music meant a lot to me growing up and they influenced my singing style too. Lee: Death. It’s never going to happen though, of course. Dylan: Eluveitie. They’re my favorite band. Matt: Revocation because they are always described as “the chilliest of the illest” by bands that tour with them. Speaking of the album again, when do you optimistically expect to release it? Sean: We’re shooting for fall or winter of this year. We have a few gigs lined up between now and April and after that our focus will be rehearsing some new songs and getting ready for the studio. Want to attend this show courtesy of a dark, mysterious force in The Scene? Enter below to win free admission for two! Giveaway ends 2/15/18. Winner will be notified via email. If he/she does not respond within 24 hours, another winner will be chosen. Winner’s first name may be used in social media posts. Hi Justin, thanks for letting us know! Which option on the widget isn’t working the way it should?